The core of this 2 hour DVD is The Names' homecoming concert at Plan K on 15 December 2007. Shot in HD with five cameras and a digital stereo soundtrack, the Plan K show features 11 songs including classic singles, new tracks and an encore cover of Magazine song The Light Pours Out of Me. The DVD also features several vintage promo clips from 1980-82, including shorts for Nightshift, Light and The Astronaut. An intimate extra bonus feature is provided by Celebration, 9 songs recorded live at a 2005 birthday party for singer/writer Michel Sordinia, where the band run through versions of a number of Names originals along with other songs. Region 0, NTSC format. 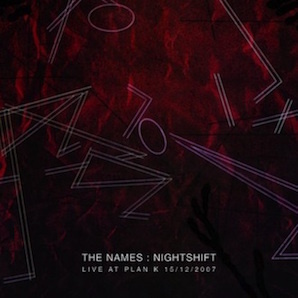 Four songs by The Names from the Plan K section of LTMDVD 2522 are also featured on the compilation DVD A Factory Night (Once Again) [LTMDVD 2519].